This week Spring has sprung in Baltimore and we have spent most of our week playing outside. Trips to the playground, outside after dinner and no coats! I love spring! We have had a stack of plastic yogurt and applesauce cups sitting in our cupboard for months and I have been trying to figure out what to use them for. This week it finally came to me, a hanging waterfall, perfect for some warm weather outdoor playing. I started by using an awl to punch two small holes into the lip of each plastic cup. The awl worked great but you could probably also use an xacto knife. 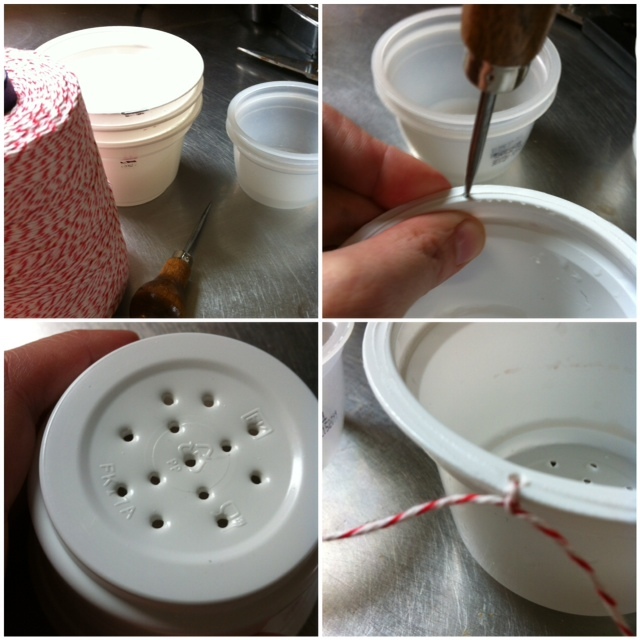 I then used the awl to poke a bunch of holes in the bottom of each cup, to let the water out. Once I had punched all the holes I used a thin bakers twine, but you could use any thin string, to tie the cups together. They were by no means, perfectly straight but it didn't seem to matter. 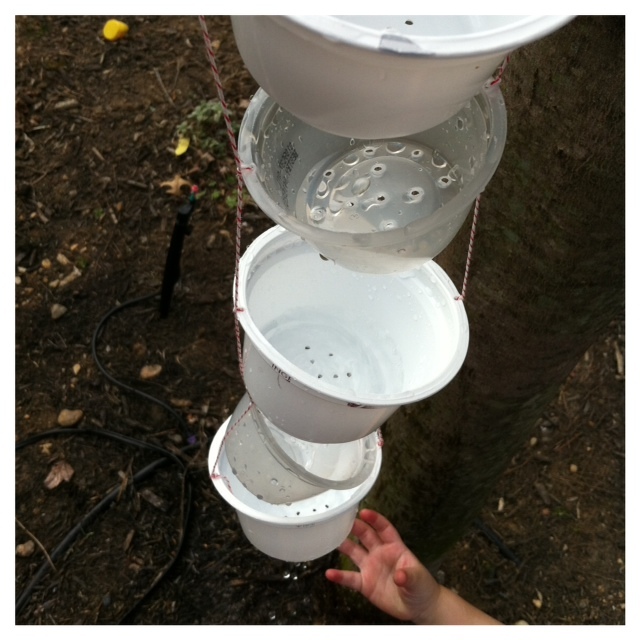 Once the cups were all strung together we hung them from a low branch in the tree in our backyard and I slowly begin pouring water into the top cup. The water then poured through each cup progressively like a waterfall. The girls were delighted and immediately started trying to catch the water trickling out. Even our old cat came over to check out the excitement and bat at the water. We spent a long time pouring the water through and experimenting with different amounts of water. I can't wait for it to get a little warmer and then we can go out in bathing suits to stand under the waterfall. I think I will try and make a few more for a hot summer day shower. I love this idea! I have been wanting to add a rain chain to my yard and have tried to figure out how to make one, this idea is even cooler. Thanks Suzanne! I was trying to figure out a better name for it and I love rain chain. I have never heard that before. What a fun idea!! I'll have to try this with my girls! 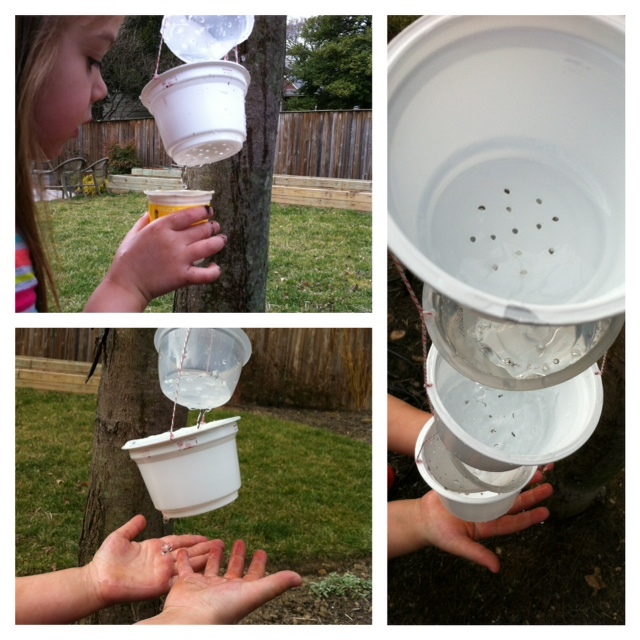 What a fun water play idea. My kids would enjoy this. Such a clever idea. I love it and will definitely give this a go with my kids. Thank you so much for sharing at The Weekly Kids co-op. ooh this is such a cool idea... must see if we can collect enough containers before our weather turns cold... just as yours warms up!